Mummies have long been of interest to scientists to achieve a better understanding of ancient cultures and learn the techniques of expert embalmers. This fascination also extends to nonscientists, who enjoy classic horror films—most notably The Mummy (1932), with Boris Karloff in the title role. Mummies are humans or animals whose bodies have been intentionally or naturally preserved long after their death. Under normal conditions, decomposition reduces the corpse to a skeleton within months. This process is hastened in hot and humid climates that favor bacterial breakdown. It can be retarded by chemicals that remove moisture from the body or in environments that are extremely cold, have very low humidity, or lack oxygen. 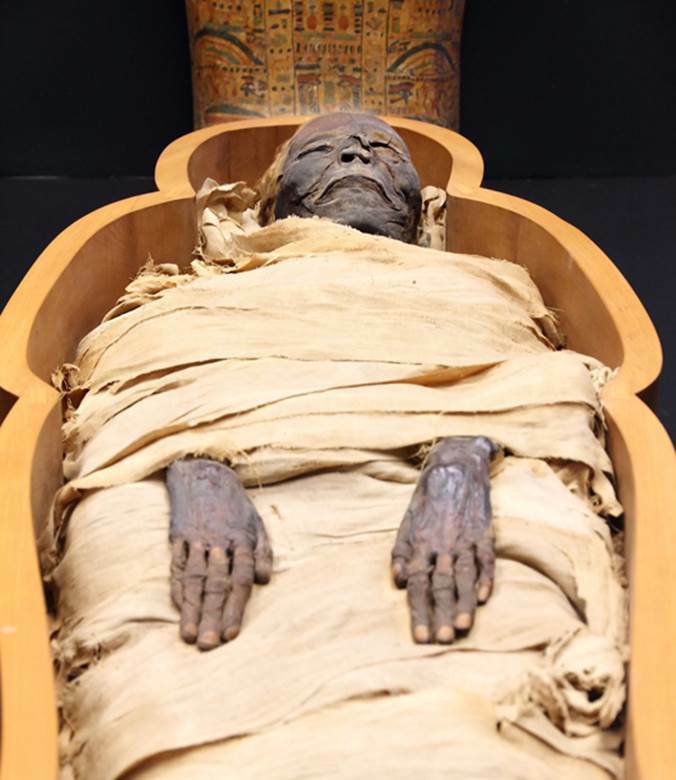 Many of these inhibiting conditions existed in ancient Egypt, where the practice of intentional mummification (to prepare the deceased for the afterlife) was so advanced that modern-day scientists are still seeking to learn their art and science. Evidence of the earliest intentional mummification dates back to approximately 2600 BCE, with the best-preserved specimens from the New Kingdom period of 1570–1075 BCE. The first surgical description appears in Herodotus’s The History in which he describes the removal of the brain and all internal organs, except the heart, which was filled with spices, thought to be the center of a person’s being and intelligence. Natron, a natural desert salt, was used to remove moisture from the body to hasten dehydration and prevent decomposition; the body was permitted to dry for seventy days and then wrapped in linen and canvas for protection. For religious reasons, some animals were also mummified, including sacred bulls, cats, birds, and crocodiles. Examples of natural mummies have been found all over the world in the ice of glaciers, the arid desert, and oxygen-depleted peat bogs. Perhaps the most famous and best preserved of these is Ötzi the Iceman, who was found in 1991 in the Alps on the Italian-Austrian border; he was some 45 years of age when he died and lived about 3300 BCE. The most notable modern mummies are Vladimir Lenin and Eva Peron, who died in 1924 and 1952, respectively. Ancient Egyptians perceived the preservation of the body after death, an integral practice of the Egyptian religion, as important to living well in the afterlife and as a status symbol for the wealthy. Conspicuous signs of wealth included more elaborate tombs and embalming procedures.